For the last several years, Kansas City has been on a fast-track to development and change. We can expect even more changes in this new year. KANSAS CITY, Mo. — For the last several years, Kansas City, Missouri, has been on a fast-track to development and change. We can expect even more changes in this new year. The issue that continues to stir up a lot of conversation is the new single terminal at KCI . We recently got a look at the new renderings , but will a groundbreaking happen this month as Edgemoor promises? The airlines are still disputing the nearly $2 billion cost, as well as who will pay for the baggage system. The city is waiting on the results of an environmental assessment before they can start demolishing Terminal A. "As soon as we get the issues with the airlines, baggage claim and the FAA we can start swinging a sledgehammer at Terminal A," said Mayor Sly James. The city may be able to borrow $400 million from the federal government's Transportation Infrastructure Finance and Innovation Act (TIFIA) funding that they'd pay back over time. They'd be able to borrow it on a two percent interest rate. "We might be the first airport in the country to use TIFIA to help finance the terminal, which is a great way to lower the cost to our fliers who are going to pay the bills," said city manager Troy Schulte. On the ground, streetcar extensions north and south are in the works. The city should find out in the next few weeks if the government will allocate $151 million, about half of what it's going to take to extend the line to UMKC. 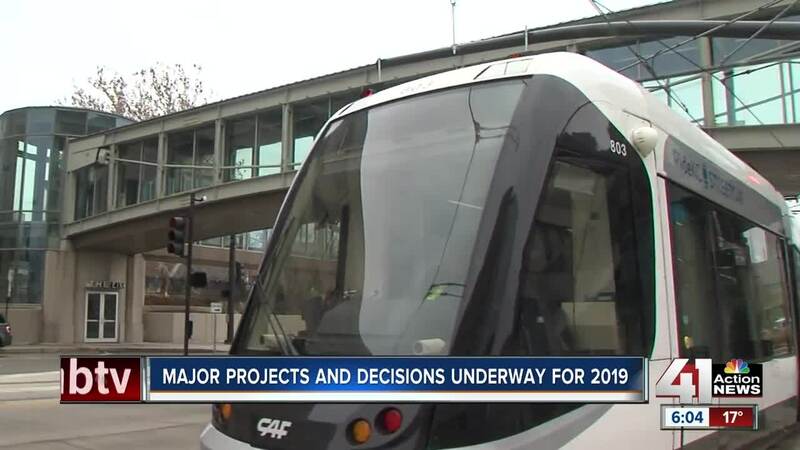 "We've received some preliminary feedback from the FTA in which they think it looks pretty good and we're rating pretty high," said streetcar spokesperson Donna Mandelbaum. The city plans to submit proposals for funding in spring to extend the line to the riverfront. Leadership in KCMO is changing this year. Nine people are running for mayor, inlcuding current council members, businesspeople and attorneys. Jason Kander dropped out and councilwoman Jolie Justus threw her name back in. East High School held a forum in December in which all nine candidates weighed in on hot topics. The primaries start in April. The new mayor takes office in August. Leadership of the Jackson County jail is now in the hands of the sheriff's office. Sheriff Darryl Forte' wants to start a Inmate Advisory Council comprised of current and former inmates. Forte' has several issues to address within the facility, highlighted in a scathing grand jury report released in May. Happening on June 5, the Missouri Department of Health and Senior Services will start accepting application fees from those who want to operate a medical marijuana facility. The fees are non-refundable. Cultivation facilities will pay $10,000. Dispensaries will pay $6,000. Medical marijuana-infused manufacturing facilities will pay $6,000. Both Missouri and Kansas also recently passed hemp laws . Missouri has a 2,000 acre growing cap , while Kansas has none.